1. Jesus- Yep still #1 on the list. I am now of an age where I lived 1/2 my life for Satan/Gilbert/things of the world, and 1/2 my life for Jesus. Let me say this 2nd half has been way better. Not only that He would save me from my sins but that He continues to use me is just mind blowing. So thank you Jesus! 2. Lisa And for the 10th consecutive year, no surprise at my #2 pick. Not sure what I can say that I haven’t already said. Each year keeps getting better and better and we still hopefully have many years of life together. The thought that it can get even better is kind of mind blowing. There is no one I’d rather spend time with than her and that she feels the same about me is phenomenal. 3. New Building- The beginning of this year was devoted to the renovations of the building of the church that I pastor at. It was truly a labor of love by over 60+ volunteers. A special thanks to Mike Sellers and Brii Reichley for going above and beyond the call of duty! Here is one last link to give you an idea of how it all comes together on a Sunday morning. 4. All the People at Exponential These past 6 years have been a series of ups and downs trying to get a brand new church started from scratch. Many of the people who made the transition with us into our own facility have been with us now for years. During the tough times it would have been easy to give up on our hopes and dreams but you guys have stuck with us and now we’re seeing some great momentum as God is using us in even greater ways than He ever has before. It’s my honor to be your pastor…the best is yet to come! 5. My Family- From mom & dad to my sister and in-laws and everyone in-between, aunts, uncles, cousins and others, I have an incredibly loving and supportive family. I don’t get to see all of them as often as I’d like but when we do it feels so natural. I lost my grandfather this year and now only have 1 of my 4 grandparents still living. I cherish the moments I shared with each of them and look forward to creating new memories with the rest of my family during the 2016 holidays and throughout 2017. 6.John Gonzalez(Drewpeacoq8, Dancing Nancy)- John also made the list last year and as of that time he had been a Christian for just a few weeks. Wow what a difference a year has made! His hunger to grow in his new faith has been truly amazing. I had the honor of performing he and Brandy’s wedding not just once but twice (NC and PA) and our friendship grows on a weekly basis. Hardly a day goes by that we don’t talk with one another in one way or another and we continue to inspire one another in a whole host of ways. So thankful that God brought us together and that in just a few days we’ll be vacationing with John and Brandy once again. 7. Travel- Lisa and I have been fortunate but at the same time very intentional about vacationing and traveling each year. This year we spent 3 weeks out west and saw some pretty incredible sites…looking forward to seeing many more in the future. 8. New Car- Lisa and I have a philosophy that the sole purpose of a car is to get you from point A to point B and do it safely. Every financial guru will tell you that the worst thing you can do is to have a loan or lease for a vehicle since they depreciate so quickly. So with that said we run our cars until they are dead and the cost and time of repairs is getting to be too much of a burden. That point finally came with my car last week and so for the 6th consecutive time we’ve needed to purchase a vehicle we went out, negotiated a great deal and then paid cash for the new car. Immediately now we will start setting money aside each month that will be designated to purchasing the next new one…it’s an easy plan and long term over our lifetime will save us 10’s of thousands of dollars that we’ll be able to use in much better ways. So thankful that we got great financial teaching from Larry Burkett while we were still engaged and have followed his plan. 9. Playing Cards- When I was a kid I used to sit in front of the TV at night and not only watch TV but also play various types of solitaire games. Keep in mind this was before you could play solitaire on your computer since, THERE WERE NO COMPUTERS! 😉 Not only would I play them but I kept a notebook keeping track of all my results. For whatever reason even as a kid I was interested in numbers and statistics. Later during my teen years and early adult years, playing cards provided me a living as I performed as a professional magician. And now in my 30’s and 40’s, I once again find myself sitting in front of the TV at night not only watching TV but playing a game that relies extensively on math and statistics. Ironically enough now because of computers, I don’t actually need the cards anymore! 2016 has been yet another great poker year for me but not just from the financial aspect. The ministry that I get to do with and for players is amazing. Almost every week God opens up a door to help a player out from a spiritual aspect and the growth in many has been incredible. I can’t wait to see what a new year brings! A few years back I wrote a post called, 1 Sit-up Per Day Could Change Your Life. Recently I read a book called Mini Habits, which talks about this same concept. Basically the premise is this…we often try to create new habits (diet, exercise, reading, writing, etc.) through sheer willpower. The problem though is often our willpower is not strong enough, consistently enough, so we give up. So mini habits are goals which the author calls “stupid small”. He changed his whole life through a commitment to do 1 push up per day. 1 push-up is so easy to do…even when you don’t feel like it…so no willpower is really needed. But an amazing thing happens while you’re down there doing your one push-up. You’ll likely go ahead and do a few more. After all you’re already on the floor and in the proper position. Now remember the goal was just one. There is no obligation to do more, but if you feel like it you can. This same approach can be taken for any new habit you want to form. Break it down to such a super small (stupid) goal that you can’t help but take the 1 minute per day or so that it might take. 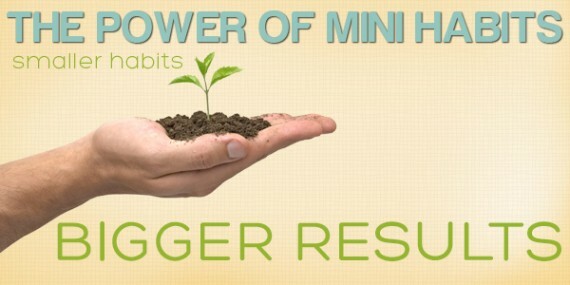 Again your only obligation is to meet the mini habit…if you do more it’s a bonus! The reason I’m posting this, is I read the book as a part of preparation for a series we did at the church I pastor and it really impacted me. I really want to be consistent in my blogging and was for years. However, after years of blogging on a daily basis I began to burn out on it. So then I decided on a daily topic type of approach but that didn’t work either. So mini habits are my latest way to try to get back into it. The plan is this. Write 50 words per day. That’s it! Basically that is 2-3 sentences usually. If I write more than that then great. If I don’t that’s ok, because I’ve met my goal. I’ll just keep writing 50 words per day until I feel a post is complete, then I’ll post it. In this way the pressure to produce something daily or X number of times per week will be taken away. To show you how this works, I wrote this post over a 5-day period. Included in that were 2 days of shoveling snow that completely wore me out. To be honest, I’m was so sore I didn’t want to write but then I remembered…”It’s only 50 words! You can do that even with sore muscles and a pounding headache”. Funny thing is, on one of those days I wrote most of this post. That just shows that often the motivation is just taking the first step. So what mini habits can you start? One push-up per day? One bible verse per day? Take a 50 step walk? Write or read 50 words per day? Put a penny into your savings account? Again make the goal stupid small so that you’ll see success every day and I think you’ll be pleased with the results! Would love to hear your thoughts on mini habits or any questions you might have. Also, if you’re inspired to start a mini habit, post it on here so we can help encourage you along. I also downloaded an app for my phone called, “Habit Streak” that prompts me each day to do my mini habits and keeps a record of how many days in a row I’ve been successful and gives me other reports on my progress. Don’t do as much blogging as I used to but every year since 2007, I have done this list of things I’m thankful for so not stopping now! 1. Jesus– Surprise, Surprise…the now 9 time champion! What else can I say but that He is everything to me and I’m continually amazed that not only has He forgiven me but He uses me to accomplish His will here on the earth sometimes in the most unusual ways. I don’t deserve anything from Him yet He keeps blessing me. I know some of you reading this think that Christianity is restrictive, but it’s actually the opposite…the freedom to know you’re exactly where God wants you to be is such an awesome feeling and it’s something only Jesus can provide. I liken it to traffic laws…they aren’t there to restrict you but to keep you safe. Because of them you have more freedom not less because there is order to things. God and His Word are the same way. The more you get to know Him the more you realize He always has your best intentions at heart whenever He says to do something or not to do it. 2. Lisa– This year we celebrated our 20th wedding anniversary and I know it sounds like a cliche but our marriage just keeps getting better and better! Words can’t even begin to describe how awesome she is and everyday I thank God that I won the wife lottery because I definitely don’t deserve her. Can’t wait to see what the next 20 years brings! 3. My Health– As many of you know I contracted some sort of bacteria/virus this summer while in Costa Rica which had me basically lying in bed extremely sick for a month. So I’m thankful I have my health back but I’m even more appreciative of those that have chronic illness, etc. I only had a month of illness and the mental side was as bad as the physical side. So for those of you who suffer all the time, I can somewhat empathize and want you to know I’m praying for you. Everyday now even with my minor aches and pains of getting older, I realize what a gift my somewhat normal health is. 4. New Building– Last year at Thanksgiving we thought it was just a matter of time until we closed on our new church building. Little did we know that it would take an entire year to finally close…which we did 17 days ago! The Church is people not a building but a building will definitely help. Can’t wait to see how God is going to use this new tool on our tool belt. 5. The People of ExponentialChurch.tv– Our church celebrated it’s 5th birthday this year and through those years literally hundreds of people have walked through the doors and been a part. Some were there just a week, some months, others for years. 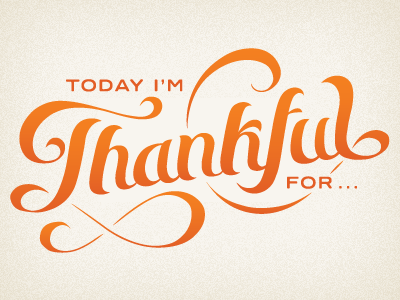 Each and everyone is loved and appreciated but I’m especially thankful for those we have right now. They have stuck through the good and the bad times and are currently a part of God being on the move in our midst. Their generosity of time and money is inspiring and I can’t wait to see what the next 5 years will bring as we continue to communicate through our words and actions that You Matter to God and You Matter to me. 6. My Mom and Dad– They are a part of #5 above…which is kind of funny. When I pastored a church 20 minutes from their home, they would show up 1-2 times per year. The when I pastored a church 30 minutes from their home, they started showing up 3-4 times per year. Now that I’m an hour plus away, they show up every week! What an honor to be able to be your parent’s pastor. But even more so, what dedication on their part to come up not just on Sunday’s but sometimes multiple times during the week to serve the people of Harrisburg in various ways. I’m so thankful that we get to work side by side in the most important task in the world…showing other people the love of Jesus. 7. Family on Both Sides– Lisa and I are fortunate to have relatives that we actually really like. I can’t think of a single relative that we ever dread having to be around. While we don’t get to see everyone as much as what we’d always like, things like Facebook help to keep tabs on everyone and stay invested in some way in their lives. I love the times we are able to get together and the fun we have! 8. DrewPeacoq8– In the real world better known as John Gonzalez. 3+ years ago John was the first of my 3 poker coaches that I hired. Immediately we hit it off and as the years have progressed he has gone from coach to friend to as of a few weeks ago a brother in Christ. Almost daily, whether it be phone, text, chat, email etc we are in communication with one another and increasingly it’s less and less about the game we both love and about life and living life to it’s fullest. He truly has become one of my best friends…in fact, Lisa and I are leaving tonight after family stuff to head to North Carolina to spend a few days with John and Brandy. Can’t wait to hang! 9. Poker in General– It’s amazing all the ways a card game has impacted my life. First, I still find it extremely relaxing as a way to unwind after a day of church stuff. Second, it has allowed me to expand my ministry reach. Whether it’s helping local players through various personal issues or the opportunities I’m getting nationally and globally to share the good news of Jesus, it’s so cool to be able to make an impact for the Kingdom of God in an area that so desperately needs it but yet many Christians would steer clear of. Third is from a financial stand point. This year especially I have been crushing tournaments which has allowed us to not have to depend on Lisa for any income, which in turn is allowing her to pursue some of her own dreams and goals. Last, it is an avenue to keep my naturally competitive juices flowing. Not only from tourney to tourney, but also each week when the new global rankings come out it’s fun to see how I stack up. As of this week, I’m the #1 online player in PA, #16 in the United States and #1110 in the world. 10. You– If you’ve read all the way through this then chances are you’re someone close to me and I just want to say thank you for your love, encouragement, friendship and support. No matter what area of life I know you from, my life is better because you’re in it…here’s to many more years of doing life together! Happy Thanksgiving!